Theresa May is the new Prime Minister. There will be no election, either by members of the Conservative Party, or (far more importantly) the British electorate: there will be no General Election. In that decision, established by May even before her ‘victory’ had been ratified by the Party, we are provided with the real purpose of this extraordinary political operation. The Conservative Party lost the Referendum. It lost a Prime Minister. It lost every single alternative leader to May, without a fight. The leading Brexit Politicians, famous names already forgotten, faced with leading the country to the land of milk and honey they had promised the electorate with dogmatic authority only a week earlier, chose instead to desert the ship (with less cause than Conrad’s ‘Lord Jim’); to Theresa May: a leading Minister in a soundly defeated Government on the most important policy that mandated the Conservative claim to power. Indeed Theresa May was Home Secretary: the post above all others in Government responsible for an immigration policy that, whatever anyone’s opinion (I write as an unapologetic pro-European), was at the very heart of the electorate’s rejection of the Government. Theresa May is the very last person who is entitled to take the role of Prime Minister (at least without a General Election). 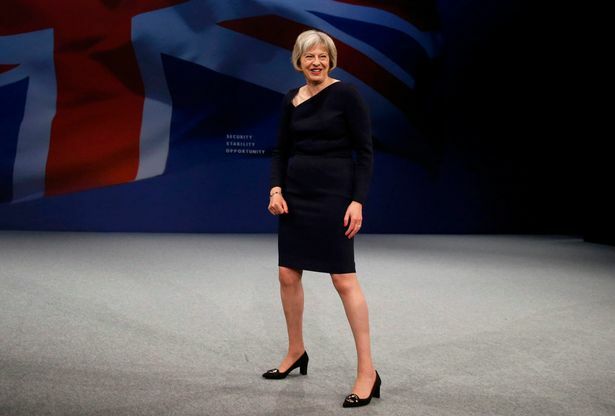 Thus Theresa May is chosen by less than 200 Conservative MPs to be Prime Minister. The Conservative Brexiteers, supporters in turn of Boris Johnson, Gove, Leadsom, have fallen cravenly in to line with their Conservative opponents on the EU to follow Theresa May’s leadership to lead Britain through Brexit. Why? Theresa May’s speech on 11th May in Birmigham provides the key words that explain what is happening for everybody else. It requires some deconstruction. The key words on which she alone relies for the credibility of her leadership and no election, are “stability”, “experience”, and that longstanding favourite, the need to stamp out “uncertainty”. These are the critical words on which a desperate Party, filled to the point of hysteria with desperate people, in support of a defeated Government, will cling like leeches to power, in justification (when we strip matters down to the essence) of serving their own interests. Uncertainty, for the avoidance of doubt, is the norm. Uncertainty is reality. Only a few accountants and politicians actually believe anything else. Such appeals, through key trigger-words like “experience” is to encourage the public to choose ‘continuity’ above all else: in practical terms, this means that whatever happens power will continue to be exercised by the same Government, the same Party and largely the same people as the Government, Party and people that just moments before have comprehensively and angrily been rejected wholesale by the electorate; nevertheless what the electorate will receive with Conservative ‘experience’ and continuity, is the “status quo ante”. The electorate can vote for whatever they like; but power will still be exercised by the Conservative Party, with only a few minor sacrifices of personnel for the decisive electoral rejection of fundamental Conservative policy on which their mandate for power relies; in context only extremely minor sacrifices are being made. The Conservative Party’s success depends on one robustly consistent principle being held by its MPs: the Party interest is the National Interest. The rest of Theresa May’s words in Birmingham are just rhetoric; the kind of bloated, meaningless rhetoric we may remember from Margaret Thatcher’s simpering reference to St.Francis of Assisi when she entered 10, Downing Street in 1979. “Brexit means Brexit”: a tautology. Nobody knows what will be negotiated with the EU. There is no Plan. May does not have one. Indeed nobody knows (nobody ever knew) what Brexit actually means; but you are going to find out, and you may be sure that it will not be quite what you expected: whatever you expect. I have to hand it to Mrs May for her braggadocio, her sheer gall in writing precisely these deeply inappropriate words. Examine the words: “right now”. Right now must refer us back precisely to the people who are now in charge of governing Britain. The Conservatives. Theresa May. Mrs May invites those with “no other choice” to put their faith in the people who eliminated their choices; created the injustices, hardened their lives, treated them more harshly, and shortened their lives. The appeal Mrs May is in fact making, is simply to assert on no good grounds whatsoever that the electorate should simply accept this introspective coronation of insider political failures (most of whom ran from the fight), without let, hindrance or political incovenience, to carry on regardless: regardless of absolutely everything that has gone wrong in this, quite obviously failed Government. We are to trust the Party and Government that is demonstrably guilty of this accumulated, endless abuse that Theresa May outlines so eloquently, and simply endorse stoically its new leading light when suddenly she gratuitously offers a few soft words in a crisis; which is all that the Conservative Party can ever be expected to offer, to counter the obvious reassertion of the juggernaut that endlessly delivers the Conservative neoliberal ‘status quo’. A new ‘leader’ who, we are supposed to believe, is now going to change everything; and suddenly, out of nothing at all, make a society, democracy and Party that works “for everyone”. Well, all the rhetorical flourishes are there in Theresa May’s words, but the content is a nullity. Perhaps not everything; because at the end of all this May bluster we return to what really lies at the heart of this change-without-change: as Mrs May points out “From Robert Peel to Lady Thatcher, from Joseph Chamberlain to Winston Churchill” it is the Conservative Party that rises to the occasion. I doubt if Margaret Thatcher could be said even by her most ardent apologists as producing a “society that works for everyone, so we can bring people back together”. From Theresa May’s slapdash list it may also be worth mentioning that Joseph Chamberlain never was Prime Minister, Winston Churchill was not a Conservative, but a lifelong Whig-Liberal who crossed the floor, and was cheerfully loathed by his new Party to a degree that has only subsequently been matched by Jeremy Corbyn in Labour ranks (in the 1930s his own constituency party chairman not only tried to have Churchill de-selected, but to have Churchill thrown out of the Conservative Party). I offer as more persuasive evidence of what the electorate may expect of the Conservatives when allowed both to continue in power and wallow in demonstrable failure and ill-hidden panic; three Conservative Prime Ministers who were asked to lead Britain in a crisis: Neville Chamberlain, Anthony Eden and David Cameron. I rest my case. The reason that we are being hurried into this passive acceptance of Theresa May’s coronation is to keep the same Conservative Government, with the same MPs and often the same discredited government personnel in power. Unlike the Labour Party, the Conservatives will bury deep their divisions to serve the prime purpose, the only substantive purpose; retaining the Conservatives in power. The Conservative Party devised the EU referendum, then appeared at the head of both the Leave and Remain campaigns. This was not an accident. The Conservative Party did not intend to lose the referendum, even if the Government lost. In a genuinely Orwellian turn to the right, losing is winning: And, lo the Conservative Government has not lost power, not even a Remain Home Secretary lost anything. She has been promoted. The only ‘surprise’ is, perhaps that nobody among the Brexiteers could actually lead anything. Remain has lost the referendum, but the new Remain leader has been crowned by the Brexiteers. If you wish to understand the real political priorities, stripped of ‘guff’, it is all found in these outcomes. Theresa May’s desire to avoid a General Election has little to do with the need for ‘stability’ and ‘experience’. We have had a Referendum that voted for Brexit; the credibility and authority not just of the Conservatives, or Labour, but of the Westminster Parliament itself has been deeply shaken. Mrs May has no mandate, and not just on a personal level; her Government was defeated in its key policy. The Conservatives have no mandate, and around 200 MPs do not replace the omission. In the circumstances of current national gravity (quite unlike the rise to power of Gordon Brown or even Nicola Sturgeon) it serves Westminster ill for Mrs May to hide behind the spurious attempts to ‘make smoke’ by appealing to implausible constitutional hurdles (fixed parliaments, soft-centred precedents) to avoid doing the right thing. Why then, does Mrs May not hold a General Election? The Labour Party is in disarray, perhaps terminally. Theoretically the prospects could scarcely be more favourable for May; and yet. The Conservatives will not hold a General Election because they are terrified of the ‘uncertainty’ against which they claim to be the only answer. The uncertainty we are invited to worry about, is not yours, or mine, or the economy’s, or Britain’s; it is the Conservatives’ uncertainty about themselves that is the real problem. They are afraid of Remain electors who may turn against them for their abject incompetence. Conservative MPs with small majorities in 2015 are frightened they may lose. The Party is afraid that the Brexiteer voters who voted to Leave, will not have been impressed by the Conservative Brexiteer leadership (Johnson and Gove), will not support the coronation of Mrs May, but turn against the Conservatives and may reward UKIP for its efforts. The Conservatives are scared. They are not the answer to uncertainty; they represent it. This is how Britain is now being governed; by people happy to negotiate tough with the EU, but too frightened to seek a mandate from its own people. Does anyone who doesn’t vote for the Tories, actually believe a word of Theresa May’s description of the government she will lead? The ideas put forward could easily have come from any leader of a left of centre party ! Since her time as Home Secretary has never suggested that she is a left of centre Tory, and her voting pattern puts her firmly on the right of the Tory Party, has she suddenly acquired a conscience , and wants to help all those sections of society that her party has hurt or ignored over the last two parliaments? Pigs might fly, but Mrs May has an awful lot to do, to persuade anybody but a Tory voter, that her words mean anything beneficial to the poor or disabled or elderly! I may be very cynical, but I do not believe a word she said! Many thanks for this. It’s a great pity I have to go to Scotland for such clear and independent writing. Feel a bit better now! The trouble is though (and this is the real tragedy of the whole situation) to whom can they turn? Labour (who have abandoned any pretence of principle or competence in order to cannibalise themselves)? Or the Lib Dems (who abandoned any principals to secure a whiff of power)? Or UKIP (who at least have principals, even if they are abhorrent, but no shred of competence)? In Scotland we have an alternative, but most of the UK is not so lucky. This is a ‘don’t scare the horses’ speech ! We had similar lies from Cameron, and see where that took us. Things will only get worse, more of the UK will be ‘outsourced’, sold to american corps, or the british versions of. How long before we see tent cities, and armed police shoot first / ask after policies, serious unrest is on the way! The snp with the green party NEEDS to start putting in place those institutions that we need for a comprehensive YES vote for Independence, Currency, central bank, infrastructure, and some form of LVT or AGR, so that we can demonstrate and prove national solvency to those ‘doubters’. The unequal land ownership in Scotland, is the tail wagging the Scottish dog – this has to change. I see we have succumbed to these intrusive and resource hungry video ads, which diminish the reader’s experience? Disappointed. The video ads with sound that are appearing above. They are so bloody noisy! No need for this is there? I see now that they are from the Independent clip. UK in terminal decline as the reshuffle of Tories and the pantomime being currently played out in Labour. Or more precisely, Westminster is coming apart at the seams. All the old certainties are gone; there is only bunting, the queen doing queening, whatever that is, and the EBC’s semihagiographical bletherings about the change of personnel. Keep the oiks happy with ceremony and circus and the good Nicholas W. droning on and on and on. With Johnston as Foreign Secretary the pantomime will continue. His profound road map to Brexit will be of use!! May won’t call an election because she doesn’t need to. End of story. If by “need” you mean under compulsion, then I think you will find that the point was made in the article. The article was intended to show that there will not be a General Election, in spite of the transparent failure of May’s Government to have a genuine mandate to govern. We might explore the fact that it was the consistent failure of both Labour and Conservative governments and indeed Westminster itself that has led us to where we find ourselves now. To express this more clearly, there is often a political price to be paid, sooner or later by ‘leaders’ like Theresa May who claim to be the orchestrators of “change” when there are no grounds to believe she means it, and indeed when she has long been part of the problem, and is in no position to deny (Cabinet) responsibility; demonstrated already not least by the choices she has already shown in the selection of her Cabinet. We have been her before and the public will not enjoy watching history repeating itself. Incidentally, this is a website the survives on open discussion and debate. “End of story” is not debate, but is – if I may say – a rather crude way to attempt to terminate it. I am at a loss why you appear to believe such a clichéed, coarse choice of ‘argument’ is compelling, still less persuasive. “May won’t call an election because she doesn’t need to.” Partly, but don’t you think that if she reckoned on getting a whopping majority, she’d call one immediately? This is “democracy” in action, as John Warren explains. Good article on Common Space too, by Mark McNaught, US academic of Scottish descent working in France on why UK was never a democracy. Is there any reason for her to think that she wouldn’t get a good majority right now?